The Canadian Parliament may soon be “prorogued“. Proroguing was meant to ensure that MPs get a break once their work is done and the government has no more pressing business to attend to. It was not meant as a last minute pardon for a derelict Prime Minister desperate to hang on to fleeting power. By doing so, Harper effectively prevents a vote of non-confidence, and thus the dissolution of his power. It’s been argued that the formation of a coalition government is “un-democratic”. I disagree, for reasons put forward in my last post. But using an obscure rule of Parliament to prevent elected MPs from working, simply to cling to power? Now that is un-democratic. 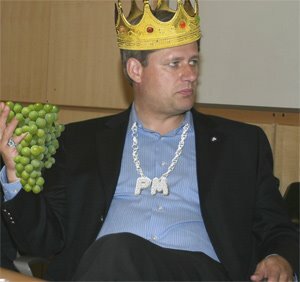 As Nasty Nicky B. put it, Harper is “peroguing” Parliament. What remains to be seen is whether the Governor General will accede to his wishes. Already, the misdirections are beginning. I cannot stress this enough: Canadians must learn how their government works. We are not the USA. American media so permeates this place that everyone assumes we have Congressmen rather than MPs, and “Secretaries” rather than “Ministers”. Right now it’s more crucial than ever before. Despite what Harper said on TV last night, Canadians did not elect him and his Conservatives a mandate to govern. Mr. Dion is correct when he said that Canadians gave every elected MP a mandate to represent. Canadians do not elect a government, we elect a Parliament. Every MP in that House, regardless of party affiliation, has the same right and responsibility to try to form a functional government. And if a functioning or non-representative government results, then every MP has a right and responsibility to disassemble that government and form a new one from within their ranks; permission from the electorate is not required, either legally or morally. It is the most democratic thing in the world to seek to form a government that represents the majority. End of story. And yes, I would say the same thing if it were a Liberal minority being taken down by a Conservative-led coalition. I’m giving a public talk on Climate Change and Global Health tomorrow (Friday) night at Roger Guindon Hall, amphitheatre B, University of Ottawa. Refreshments (and oh how refreshing they will be) will be served t 4pm, but the talky talky begins at 5pm. Also on the agenda is Dr David Fisman, whom I gather is a real expert, while I’m just a poser. So please come if you can! It promises to be interesting, if only because I’ll be stoned on muscle relaxants for my back!